Shakaia : Why It's Great To Be Me? It great to be me because I am young and free. I have different opportunities than others do. We all have a bright future ahead of us and all of us are capable doing something new each day. I like exploring at new limits because you never know what you will see at the end of the rainbow until you go for it. 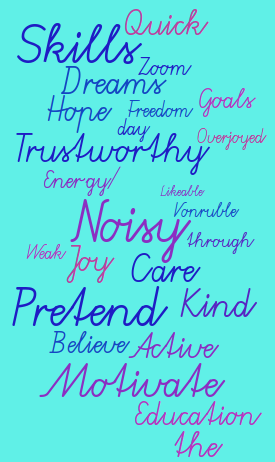 I was working with Brooklyn to complete this word cloud. My favourite word in this would have to be dreams. Because they tell you what might happen in the future. I like the things you have said about why it is great to be you. You have a positive attitude and I hope you keep striving to be the best person you can be. I really like your work that you have made on word cloud and how you have put words that explain you. Your work is great and i like it.I like that u said you are young and free. I love the colors that you used for your 'Why Is It Great To Be Me' word cloud and the words that you used to describe yourself. I really enjoyed reading about you'r word cloud and all the cool words you putted in. I also like why it's great to be you and that you have a bright future ahead of you.